Powers/Abilities: Jason is a member of a race of humanoid aliens from the planet Sparta whose external appearance is identical to that of Caucasian Humans from Earth. The greatest known physical difference between a normal member of this race and a normal Terran Human is that the "Spartans" have much longer potential lifespans than Terrans. While the maximum age which has ever been attained by any "Spartan" has not yet been revealed, it is known that Emperor Jason considered himself to be "barely middle-aged" at a time when he was at least 130 (Imperial/Sparta) years old. It is presumed that an average member of this race would possess the same physical abilities as those of a Terran human of her/his apparent age. As Emperor, Jason commands the "Spartan" Empire, and thus has control of a large galactic fleet. The Empire has interstellar starships armed with various destructive and defensive weapons. Jason himself may (or may not) be a skilled pilot. In his youth, Jason possessed enough knowledge of scoutship systems that he was able to eventually repair his damaged craft (even while stranded on Earth). (Starlord, The Special Edition#1 (fb) - BTS) - The "Spartan" Empire is an interstellar state which sprawls across the better part of a galaxy (presumably, the Milky Way galaxy) in the alternate timeline designated Reality-791. (Marvel Preview#11 (fb) - BTS) - Prince Jason was the son of the "Spartan" Emperor and thus heir to the throne of the "Spartan" Empire. As such, he had his pick of the beauties of ten thousand worlds but never fell in love. Prince Jason also hated court life so much that he "fled" to deep space where, for years, he was able to indulge his heart's desire to explore. (Marvel Preview#11 (fb) - BTS) - At some point, Prince Jason was joined by a companion, a male feline humanoid whose name has not yet been revealed. (Marvel Preview#11 (fb)) <Earth date Spring, 1960 A.D.> - War broke out between the Spartan Empire and the Ariguan Confederacy, and Jason's father summoned him home. However, while en route his scoutship blew a converter, and Jason (and his companion) had to make planet-fall at once, before the entire warp drive melted itself down to slag. Earth was the only viable planet within range and even then the scoutship almost didn't make it. The scoutship crash-landed on Earth in the Colorado Mountains and the only human to witness it was Meredith Quill who was walking home in the snow carrying a bag of groceries. Despite the danger and not knowing where the craft was from, Meredith entered the burning scoutship and made her way to its flight deck where she found Jason unconscious and his companion dead. Meredith dragged Jason's armored form outside and away from the flames, then she removed his helmet and performed CPR to get him to start breathing again. (Marvel Preview#11 (fb) - BTS) - Once Jason was breathing, Meredith brought him to her home and nursed him back to health. During this period, she also removed the body of Jason's friend from the scoutship and buried it. While doing so, she noticed that he was a cat, shaped like a man, and realized that both he and Jason were not from Earth. Meredith chose to not call the authorities. (Marvel Preview#11 (fb)) - Once Jason had recovered somewhat, Meredith revealed what she had done about his friend's body and the conclusion she had reached about their non-terrestrial origin. Jason told her the truth, feeling that he owed her at least that much, and Meredith listened with a grave face. Then she smiled because, alien or not, Jason didn't look like any Bug-Eyed Monster and she liked him. As soon as he was able, Jason began to work on repairing the scoutship with Meredith watching and helping where she could. Mostly, Jason and Meredith talked and, over time, fell in love with each other. (Marvel Preview#11 (fb) - BTS) - As the repairs neared completion, Jason's bio-comps told him that Meredith was pregnant with their son. (Conjecture) - Jason told Meredith about her pregnancy, and the two of them decided to name their son "Peter Jason Quill." (Marvel Preview#11 (fb)) - A year after Jason had arrived, the repairs were completed and Jason was ready to leave. Meredith asked Jason to take her with him, but he refused because the scoutship's warp drive was jury-rigged and there was no guarantee that he would get home. Also, Jason would have to cut through Ariguan space, and the Ariguans would be "not kind" to any aliens whom they took as prisoners. However, Jason told Meredith that he would return for her as soon as he could. (Conjecture) - Jason (presumably) told Meredith that her knowledge of him would (somehow) be dangerous to her and she (apparently) agreed to allow him to suppress her memories of their year together. (Marvel Preview#11 (fb)) - Jason's scoutship lifted off with Meredith watching and waving goodbye. Soon afterwards, the mindlock Jason had placed on Meredith's memories of him took effect, and she only remembered the year they'd spent together as a dream. Within a month, Meredith would find herself betrothed and married to her childhood sweetheart, Jake. (Marvel Preview#11 (fb)) - Despite his concerns, Jason made it home without incident. However, the war against the Ariguans was going badly, and Jason was needed to help fight the war, so he was unable to immediately return to Earth. (Marvel Preview#4 - BTS) <Earth date February 4, 1962 A.D.> - Meredith Quill gave birth to a son whom she named Peter Jason Quill. For some reason, the fact that his middle name was "Jason" was a secret known to nobody (on Earth) except Meredith and her son. (Conjecture) - At some point, Jason's father died (or abdicated?) and Jason succeeded him as Emperor. Since Jason had no (known) offspring, his uncle Prince Gareth would then have become heir apparent to the throne. (Starlord, The Special Edition#1 (fb) - BTS) - At his coronation, Jason pledged to do his best, to do what was right. In time, because he believed, his people came to believe as well -- and his ideas became reality throughout the stars. (Marvel Preview|#11 (fb)) <Earth year 1973 A.D.> - After 12 (Earth) years, the balance of the war finally tipped in favor of the Spartans but even then Jason's responsibilities as Emperor meant that he still couldn't get away. Realizing that there was no way to know when he would ever have the opportunity to go to Earth himself to bring Meredith and their son to Sparta, Jason turned to his uncle Gareth for help. Gareth accepted the task, stating that it would be his pleasure to bring Jason's "wife and heir" to Sparta. Gareth then accused Jason of being a "romantic devil" and stated that he hadn't thought Jason had it in him. (Marvel Preview|#11 (fb) - BTS) <Earth date August, 1973 A.D.> - After having (supposedly) gone to Earth, Prince Gareth "returned" and told Jason that Meredith and her child had both died in childbirth. Jason was devastated by this news and felt that a part of him died then, too. In the following years, he never loved again and never married. (Marvel Preview#11 (fb) - BTS) - Under Emperor Jason's leadership, the Spartan Empire defeated the Ariguan Confederacy. A holo-painting was created to commemorate his victory. (Marvel Preview#4 - BTS) <Earth date February 9, 1990 A.D.> - The Master of the Sun transformed Peter Jason Quill into the Starlord. (Marvel Preview#11 (fb) - BTS) - As the thirtieth anniversary of Emperor Jason's coronation approached, preparations for a planned coup d'état to replace him with Prince Gareth came closer to being realized. By this time, a number of planets had been attacked by slavers who had exterminated almost all of their populations, enslaved the few survivors, and then used unknown means to render those planets uninhabitable. (Marvel Preview#11 - BTS) - As an unidentified alien starship, which was somehow connected to a recent multi-megaton fusion explosion on the planet Cinnibar approached Sparta, it was ambushed by an Imperial hunter-killer group who had been looking for it and were determined to prevent it from reaching the Imperial Homeworld. After a brief but furious battle, the starship was seemingly destroyed and went down in flames over the Spartan continent of Thrace but not before ejecting a lifeboat. The commander of the task force, Prince Gareth, ordered that the lifeboat was to be followed down and its occupants were to be taken alive for questioning. He reminded the officer that "the emperor will, of course, be told there were no survivors" so that he would consider the incident to be closed. (Marvel Preview#11 - BTS) - Three days later, Emperor Jason was in the Imperial Chalet on the Spartan continent of Marathon when he was approached by Kip Hölm and Sandy, two of the allegedly non-existent survivors from the alien starship. The duo warned Jason about a conspiracy that was planning a coup d'état to replace him with his uncle, Prince Gareth, and they (presumably) got him to listen to them by showing him the information on the coup which was contained in the data pack Star-Lord had given to them. However much (or little) Jason initially believed them, it was enough to get him to go with Kip (and Sandy?) to find Star-Lord. (Marvel Preview#11) - As Emperor Jason and his group arrived at the balcony on Sky Level 4 where Star-Lord and Prince Gareth were dueling, their approach triggered a series of actions, which ended with Gareth dead and Star-Lord surrounded by Imperial troopers who were considering killing him without a trial; but this plan was forestalled when the alien starship (Ship) arrived and threatened to level the mountain. Just then Emperor Jason arrived and demanded, "What goes on here?!?" The troopers immediately bowed their heads and saluted their liege while Star-Lord, finding himself face-to-face with someone who looked like an older version of himself, removed the rest of his mask and asked the emperor, "But...who are you?!?" And Emperor Jason replied, "Peter Jason Quill...I am your father." (Marvel Preview#11 (fb) - BTS) - Once the information in Star-Lord's data pack was confirmed, the Imperial Guard moved against Gareth's mercenaries and the fleet took up positions along the truce line to prevent any Ariguan mischief. Within a few hours of Gareth's death, the conspiracy was smashed. It was during this period that Jason learned how thoroughly his uncle had betrayed him. (Marvel Preview#11) - Later, While walking into the throne room with Star-Lord, Kip and Sandy, Jason told his son that he was forever in his debt. When Kip noticed a holo-painting of Star-Lord hanging behind the throne, Jason corrected him and revealed that the image was of him and that it had been painted to commemorate his victory over the Ariguan Confederacy. Jason then asked Sandy what was bothering her and she stated that she felt like a mark in her new (noble) outfit and that she would be happy in a tunic and pants with some pockets to pick. Jason replied that he knew how she felt and revealed that in his youth he had hated court life so much that he had fled to deep space to pursue his heart's desire to explore. The Emperor then revealed the circumstances under which he had visited Earth and met and fallen in love with Peter's mother, Meredith Quill, why he had left his beloved pregnant with a mindlock on her memories, and how, when he had asked his uncle to bring Meredith and Peter to Sparta, Gareth had betrayed him and instead gone to Kyras Shakati's palace on Cinnibar where he had commissioned the murders of "the woman and her whelp" and first revealed his plan to eventually dispose of Jason as well. Jason then revealed that Gareth had told him that Meredith and their child had died in childbirth and how a part of him had died that day, too. However, when Jason expressed how glad he was that his son had been returned to him, Peter stated that, as Star-Lord, he had the universe and didn't need to be shackled to a throne. Peter then suggested that if Jason wanted a son and heir he should adopt Kip because he would make the kind of son that Peter could never be, so long as Sandy was around to keep his head on straight. Then, as the group watched Star-Lord fly away, Jason said, "Farewell, my son. I'd give all I have to be going with you" and Kip added, "So would we..."
(Starlord, The Special Edition#1 (fb) - BTS) - Emperor Jason adopted Kip as his son and heir. At some point in the first twenty years after they met, Emperor Jason and Kip defeated the Ariguans. Twenty years after Jason first met Kip, the Empire entered a state of peace which would last for (at least) the next fifty years. At some point, Kip Hölm and Sandy were married. When Kip and Sandy were both about eighty years old, they decided to have children together. Within the space of a few years, Sandy gave birth to three children, two sons (Alain and Rhys) and one daughter (Robyn). At some point following an abortive attempt to bring Peter back, Kip encountered Ship who told him how "Starlord and Ship roamed from one end of the galaxy to the other - - and beyond - - always searching, never at peace, Peter driven by his insatiable curiosity, Ship by her love for him." Kip did not tell Jason about this encounter until some time later. Throughout the hundredth year of Emperor Jason's reign (about seventy years after Jason and Kip and Sandy all first met) the people of the Empire observed the occasion with festivities as their way of thanking their monarch for all he had given them and all he had done -- unparalleled prosperity and a half-century of peace. (Starlord, The Special Edition#1 (fb) - BTS) - During the last days of the jubilee, Jason repeatedly examined his life and found it wanting. He also realized that, despite how much he loved Kip and Sandy, he still missed his biological son, Peter. These feeling caused him to be gripped by a dark mood which Kip and Sandy both noticed, and Kip's psychic sensitivity allowed him to sense that the mood was the result of Jason looking for someone (Peter) and not finding him. Unbeknownst to anyone, Jason felt so tired that he began to seriously consider abdicating in favor of Kip. (Starlord, The Special Edition#1) - On the last night of the celebration, Jubilee Night, Jason stood on an upper balcony of the imperial palace and considered how, at his coronation one hundred years ago, he had stood on that spot and heard the crowds cheer for him out of duty whereas now they cheered from choice, which he supposed was an improvement. Jason reflected on how so much remained to be done and he was no longer equal to the task, how he was (by modern standards) barely middle-aged yet felt as old as time, and how he served from duty and not by choice and feared that he would have to bear that burden until he died. These ponderings were interrupted by the arrival of Kip, who asked Jason what was wrong, revealed that he and Sandy had noticed his recent dark mood and he had sensed that Jason sought his true son, Star-Lord. Jason acknowledged that that was true, then told Kip that he and Sandy were all the children a father could hope for, that he could not be more proud of them and their accomplishments; they were the children of his heart, Peter was the son of his body, and he loved them all, but lately he had found that he missed Peter. Kip agreed that he missed Peter as well, but before they could talk further they were set upon by three "terrors," Kip and Sandy's children, who tackled them to the floor. Sandy then arrived and Kip, pinned under his sons, asked her for help, but Jason, who had Robyn atop of him, stated (while asking Robyn to not pull Grandfather's hair) that he knew when he was beaten and surrendered. When Kip asked why they weren't in bed, Rhys protested that it was Jubilee Night and asked Grandfather if they couldn't stay up, please? Seconds later, each of the children asked to be told a story, and Kip offered to tell them a very special story to mark that very special night. It was the story of how he and their mother and grandfather had first met, and of the man who had brought them together, a man whose name was Peter Jason Quill but to them - - and the wide, wonderful universe - - he was known as Star-Lord. Kip told the children the whole story of how he had first met Sandy and then Star-Lord, up to their first meeting with Jason and Star-Lord's departure. As Kip was telling Jason about how he had encountered Ship following an abortive attempt to bring Peter back, Sandy told them to hush because the children had fallen asleep in Jason's bed. Sandy mentioned her intention to move the children back to their apartments, but Jason said that wouldn't be necessary as he planned to sleep on the roof. Jason then shocked Kip and Sandy by revealing that he planned to announce his abdication at the next day's Council meeting. Jason explained that he was tired, that he had served long enough to know when that service should end, and that he had had doubts for a long time and hearing Peter's story had crystallized them and goaded him to action. Jason then stated that he that he had done all he could and that it was now the time for younger, fresher hearts and souls. Jason told Kip that the empire was his and that he had earned it. Jason then went up to the roof to sleep, leaving Kip and Sandy behind. Later that night, on the roof, Jason had finally gotten to sleep when something awoke him. As he sat up, gun in hand, Jason found himself facing two surprise visitors: Ship and Star-Lord. Ship gave him their warmest congratulations on the occasion of his jubilee and Star-Lord simply said, "Hello...father" Jason replied, "I'd hoped you'd come, Peter. And prayed that you would stay away. Because I knew my heart would break to see you leave a second time. Because, for all my power, I could not keep you." As he removed his helmet, Peter replied that the thought of a reunion had terrified him, yet he'd wanted to see Jason and had to come because, in his roamings around the universe, he had learned the eternal truth: That the more one learns, the more one realizes how much there is to learn. Peter then revealed that he had come to realize as well how important people - - simple human contact - - LOVE - - was in the scheme of things. Peter then admitted that he had missed Jason, in part because he didn't know his father, having never given himself that chance or Jason the opportunity to know him. Extending his hand to Jason, Peter then said, "I'd like to now - - If you'll let me." (Starlord, The Special Edition#1 (fb) - BTS) - Jason agreed to go away with his son and Ship. To let Kip and Sandy know what had happened, they left two items on Jason's pillow: Jason's Imperial Seal ring and Peter's Star-Lord helmet. Then they flew away, generating a large BOOM! as they boosted out of the atmosphere. (Starlord, The Special Edition#1) - As they flew away, Ship stated that the patterns were broken and asked Jason ("Boyo") how it felt. Jason replied that it was exciting and that for the first time in ages he felt alive. Peter remarked to Ship that it was ironic that his father was becoming the daredevil swashbuckler while he was becoming the contemplative sage. After some metaphysical musings from Ship, Peter asked his father if they dared try to fulfill their (humanity's) promise and Jason replied, "Hell, yes!" Peter then told Ship, "You heard my old man, Ship. Let's go find our destiny." (Omniscient Narrative) - And they did just that. And it was indeed glorious. The Height and Weight measurements listed above are only estimates, and are derived from several images in which Jason and Star-Lord appear to be the same height. I used the height listed in the Star-Lord profile but, given that Jason was somewhat older than Star-Lord and that his lifestyle (as an emperor) was probably less active as well, I've increased his weight by 25 lbs. According to the Marvel Chronology Project, the recap of Star-Lord's origin in Marvel Spotlight (Vol. 2) #6 includes three panels with content concerning Jason's time on Earth that is different enough to be incorporated into their listing for his character. While I agree that those panels are different enough, they don't actually present any new information so I have not included them in this profile. Although both Marvel Preview#11 and Starlord, The Special Edition#1 state that that Jason's interstellar empire is ruled from the planet Sparta, the name(s) by which the empire and Jason's race are known are never mentioned. For this profile, I have chosen to use the term "Spartan" to refer to both empire and species. It's the most obvious term that can be derived from the "Sparta" place name and it also helps to distinguish the "Spartans" from the Spartoi and the Spartax races who exist in Reality-616. However, this name is not official. Jason's scoutship was carrying two people when it crashed on Earth. Jason survived but his companion, a man-like cat, died in the crash. So who was this felinoid and how long had he been traveling with Jason? These questions were never answered but it would be reasonable to assume that, as the heir to the throne of the Spartan Empire, Jason would NOT have been allowed to simply wander among the stars, at least not ALONE. It follows that the felinoid was probably someone whom Jason's father had assigned to accompany the prince as he explored deep space, a combination co-pilot/bodyguard/companion. Alternatively, if the prince did travel alone, then the felinoid could have been a messenger sent by the emperor to summon his son home. Only Chris Claremont knows for sure. When they were first written, the "classic" Star-Lord stories contained no direct connections to the "mainstream" Marvel Universe so readers were free to decide for themselves whether or not Star-Lord existed in that familiar reality. For over twenty years, this situation remain unchanged until the 2000 Inhumans miniseries seemingly revealed that Peter Quill's father, Jason of Spartax, DID exist within Reality-616 but that, since he was currently childless, his son (the Star-Lord-to-be) and his adventures were actually part of a possible future of Reality-616 and not part of its past. In 2004, things changed again when the short-lived Thanos series and the subsequent Annihilation miniseries revealed that Peter Jason Quill, formerly known as Star-Lord, existed as an adult in the "present-day" MU. This contradiction was never officially explained, but it did cast doubt on the idea that the Jason of Spartax from the Inhumans mini-series actually was the father of the Star-Lord character who existed in Reality-616. Most recently, in early 2013, writer Brian Michael Bendis presented his "streamlined and updated" origin for the Star-Lord who existed in the "mainstream" MU. Since it was impossible to reconcile this new Bendisized origin with the "classic" origin, it was decided, officially, that these two origins had to actually relate to two different versions of Star-Lord. And since the current-day Star-Lord definitely exists in Reality-616, it was decided that the "classic" Star-Lord and his adventures (and allies) would be relegated to Reality-791. This decision has certainly been been substantiated by Bendis' subsequent GOTG stories which have portrayed King J-Son of Spartax, the father of Reality-616's Star-Lord, as a VERY different type of ruler than the Emperor Jason described in this profile. In the beginning, there was One! Emperor Jason of Sparta first appeared in Marvel Preview#11 (Summer, 1977). 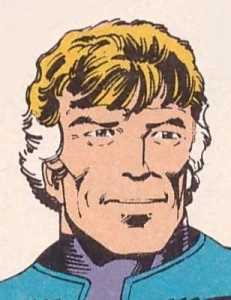 Created by writer Chris Claremont, this character was introduced as the true father of the cosmic adventurer, Star-Lord. This Jason first interacted with humans in 1960 A.D. when his scoutship crashed on Earth and he was rescued by Meredith Quill. However, as part of the "classic" Star-Lord stories, he had no confirmed connection to the Marvel Universe. And then there was... still only one? Prince Jason of Spartax first appeared in Inhumans IV#2 (July, 2000). 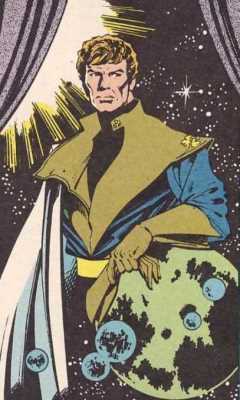 Writers Carlos Pacheco and Rafael Marin thought of this character as an earlier incarnation of the Emperor Jason from Marvel Preview and his adventure in the Inhumans miniseries was meant to serve as a prequel to his previous appearances. The co-writers chose to use Jason as a Star-Lord-like character because they wanted to introduce Star-Lord into the Marvel Universe. Of course, in the process of doing so they also altered some elements of the earlier Jason's back-story. Shifting the date of Jason's first contact with Earth from the past (1960) to sometime in a possible future (after 2000) was one major change, and revealing that Jason had had a sentient "Soulship" as his companion who would "effectively die" when they eventually crashed on Earth was another one. However, despite these inconsistencies, Star-Lord fans seemed to have generally accepted that "Jason of Spartax" and "Jason of Sparta" were/was the same person at different points in his lifetime. Of course, this idea was made somewhat more problematic in 2004 when writer Keith Giffen revealed that an adult Peter Quill was present in the modern-day mainstream Marvel Universe, decades before the Inhumans story said Star-Lord should have even existed. Despite this, the idea that there was only one Jason was not really questioned. And finally there were Three! King J-Son of Spartax first appeared (as J'Son) in Guardians of the Galaxy III#0.1 (April, 2013). This character was part of the "updated" origin of Star-Lord that was presented by writer Brian Michael Bendis. According to this Bendisized origin, J'Son of Spartax crashed on Earth "30 years ago" (1983 the topical date at the time of that story), met Meredith Quill and fathered the child who grew up to become the Star-Lord who exists in the mainstream MU. However, since there are some irreconcilable differences between the "new" and "classic" Star-Lord origins, this updated origin is now considered to be a reimagining. The simple fact that this J-Son character exists in the mainstream MU makes it clear that neither of the other two Jasons are (or ever can be) the father of Reality-616's Star-Lord. As a result, both the other Jasons had to be accorded their own separate existences. 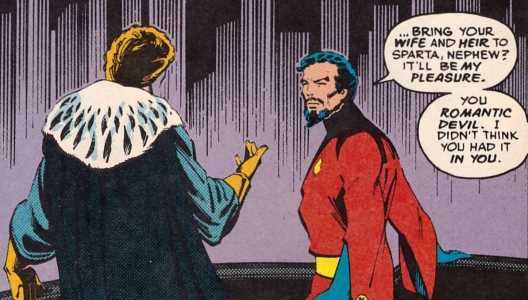 Prince Jason (presumably) remains in Reality-616 (where he will NOT be Star-Lord's father) while Emperor Jason (and the Star-Lord who is his son) have been relegated to another timeline, officially designated as Reality-791. And that is the story of how a single character named Jason was split into three characters named Jason, Jason and J-Son. 1. According to the real world's current understanding of how the evolutionary process works, the chances that life existing on any other planets could somehow evolve into forms that are identical to those of Earthly life is so extremely slim as to be (almost) completely impossible. Yet the story in Marvel Preview#11 features characters who are members of three (or more) "races" whose external appearances are all identical that of Caucasian Humans from Earth. 2. According to the real world's understanding of genetics, lifeforms which had evolved on different planets would have genetic codes which were incompatible with each other and thus they would be unable to interbreed to produce viable offspring. Yet Marvel Preview#11 also revealed that Star-Lord himself was a child who was the result of a relationship between a "Spartan" male (Jason) and a Terran female (Meredith Quill). Obviously, in real world terms, identical-to-Caucasian-Human aliens and hybrid offspring whose parents come from different species are IMPOSSIBLE. However, the Marvel Universe is a fictional continuity where such "realism" can be overridden for the sake of the needs of the story. Still, I would really prefer it if the writers of such stories would provide some explanations that would make such IMpossibilities somehow at least appear to be plausible. It's not really any more far-fetched than most sci-fi stuff...and there are so many possible explanations that is just doesn't bother me at all.--Snood. I would like to be able to present a detailed chronology of Jason's life but not enough information has been provided to make that possible. However, what data there is can be used to reach certain conclusions. First, it is known that Peter Quill was born on February 4, 1962. Given that Meredith believed that her husband Jake was the father of her child, it can be assumed that she was in the very earliest stages of her pregnancy when Jason left. From this it can be presumed that Jason left no earlier than early May of 1961 (unless the gestational period for a Spartan/Terran hybrid is longer than a normal all-human pregnancy which, if true, would help explain how Meredith could have been unaware that her child was not fathered by her new husband Jake). Finally, given that Jason left "a year after (he'd) arrived" and that there was snow on the ground when he crashed, it can be deduced that he must have crashed on Earth sometime in the spring of 1960. Second, on the final night of the celebration of the one hundredth year anniversary of Jason's coronation, Sandy stated that she had waited "eighty years" to bear her three children. Since those children appeared to be about seven years old, that would make Sandy about 87 Imperial/Sparta years old on that night. And since the slavers who attacked her homeworld Pryd'ri routinely killed off anyone over the age of seventeen, Sandy must have been no older than that when she first met Jason. Taken together, these facts indicate that Sandy first met Kip, Star-Lord and Jason about 70 years before the hundredth-year celebration or about 30 years after Jason's coronation. Third, it would be reasonable to assume that the Spartan Emperor would not allow his son and heir to go off and explore deep space until he was at least an adult and had received a rigorous training meant to increase his chances of remaining alive. For this reason, I have assumed that Jason must have been at least 25 years old when he left to explore. Using this age and adding the "years" that he spent exploring deep space and the Earth-year that he was stranded on Earth, I have further assumed that Jason was at least 30 years old when he returned to Sparta. Based on this idea, even if Jason was crowned emperor immediately after his return, then he would have been at least 130 years old during the hundredth anniversary celebration of his coronation. While these conclusions may be helpful, there are still two unknowns which make it impossible to create a definitive chronology. One unknown is that it has never been revealed exactly how long a year in the calendar system used by the Spartan Empire (henceforth referred to as an "Imperial year") is in comparison to an Earth-year. While we can assume, for convenience's sake, that the two years are similar in length, the reality is that an Imperial year could be much shorter or much longer than an Earth year. For example, if an Imperial year were only half as long as an Earth year, then Emperor Jason being 130 years old would make him about 65 Earth years old. On the other hand, if an Imperial year was 25% longer than an Earth year, then the 130-year-old Jason would be over 162 Earth years old. The second unknown is that the date of Emperor Jason's coronation has never been revealed. We know that the previous emperor, Jason's father, had to still be alive in 1960 since that was when he summoned his son home. We also know, from the conclusions detailed above, that Jason first met Star-Lord about 30 years after his coronation and that that meeting took place sometime after February of 1990. Also, some fans believe that the fact that Jason was depicted wearing a cape while speaking to Gareth about Meredith and his son in 1973 means that he was already emperor at that time but that has never been officially confirmed. Basically, the coronation could have occurred as early as 1961 or as late as sometime after Peter Quill became Star-Lord in 1990. There's just no way to tell. One easy answer would be if we were to just assume that Jason was crowned emperor immediately after he returned to Sparta (in 1961) and that one Imperial year equaled one Earth year, then his first meeting with Peter would have occurred in 1991, one year after his son was transformed into Star-Lord. While it's tempting to make such assumptions, there is no in-story evidence to support (or to contradict) them so they must remain mere speculation. Personally, I favor the idea that Jason did not become emperor until some years after his return to Sparta and/or that an Imperial year might be somewhat longer than an Earth year because such a scenario would have allowed Star-Lord the time he needed to gain the amount of experience in using his abilities that he displayed in Marvel Preview#11. But that's just my opinion. The first two Starlord stories were written by Steve Engelhart and Chris Claremont, respectively, two writers who had significantly different interpretations of the title character. As a result, story elements from those first two stories don't always mesh as well as could be desired. To smooth over these rough edges, I have included certain conjectures of mine into this profile. First, there's the matter of Peter Jason Quill's middle name. In Marvel Preview#4, Peter was shocked when the Master of the Sun called him by his full name because "No one knows my middle name!" And then, in Marvel Preview#11, when Emperor Jason sees his son for the first time, he also calls him by his full name. How could Jason know a name that only Meredith, Peter and the Master of the Sun knew? Well, the obvious answer is that Jason must have informed Meredith about her pregnancy as soon as his bio-comps revealed that fact to him and then, before he left, the two of them decided on what their son's name would be. Somehow, this choice must have seeped through the mindlock. Of course, even though this explanation is so obvious, the fact that it doesn't appear in the original story makes it mere conjecture. Second, there's the mindlock and why it was added. In the first story, there is nothing (aside from Jake's paranoid ravings) to indicate that Peter was not Meredith and Jake's son. And frankly, the fact that Jake was willing to kill a baby with an axe makes me severely doubt his credibility. However, for the second story, Chris Claremont wanted to reveal that Peter's true father was an alien but doing so would mean that Jake was, retroactively, correct and Meredith was trying to pass off another man's child as his. 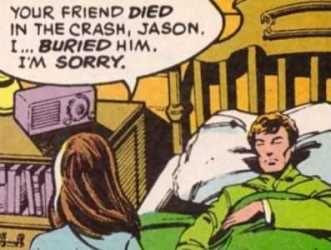 To get avoid doing this to Meredith, Claremont introduced the idea that her memories of her time with Jason had been mindlocked so that she could give birth to Jason's son while really believing that Jake was the father. For the most part, this explanation works but there are some lingering problems. For one thing, the story just says that Jason put a mindlock on her memories but it doesn't even mention if Meredith knew about and agreed to it. Obviously Meredith's cooperation is a key point because if Jason placed the mindlock without her consent then he was actually violating her mind, no matter how well-meaning he might have been, and that would make him more morally questionable than he has seemed (as was done with Professor Xavier a few years ago). However, given how the omniscient narrative has emphasized Jason's commitment to doing what was right, I feel comfortable in conjecturing that Jason did have Meredith's consent. Another problem with the mindlock is why Jason felt that it was needed. He told Peter that he put the mindlock on Meredith's memories of him and the time they spent together "for safety's sake," which presumably meant her safety but how exactly it was supposed to protect her was never explained. As things turned out, it really didn't help her at all. The fact that her memories had been suppressed led her to marry Jake, her childhood sweetheart, who turned out to be a murderous lunatic who nearly killed her baby, and the events of that night severely affected Meredith, both physically and mentally, for the rest of her life. Also, it could be argued that if Meredith had been able to remember Jason and his enemies, then she might have been much more cautious when Peter brought her into the woods to show her the spaceship that he'd seen and therefore might have been able to avoid getting killed by Rruothk'ar. Revised and expanded profile by Donald Campbell. Jason Voorhees, the recurring villain from the Friday the 13th movies.